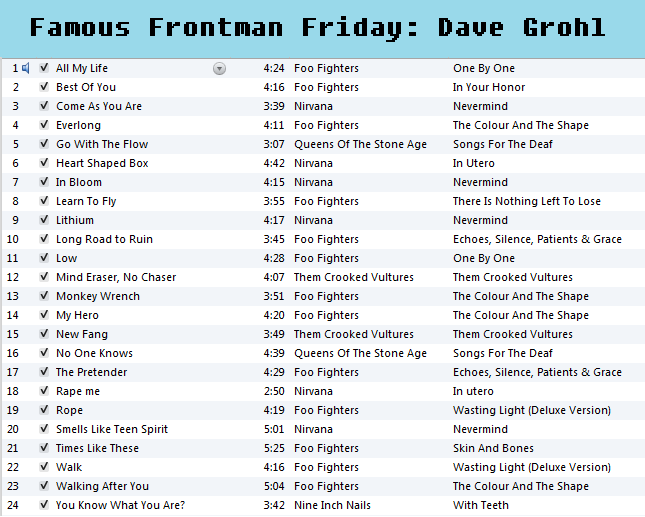 For a change of pace I have compiled a collection of Dave Grohl hits. For those of you scratching your head right now here is the low down. Dave Grohl is a multi-instrumentalist, vocalist, writer, & all around awesome performer. He is perhaps best known as the frontman of the Foo Fighters. They have had several hits and tour all over the world. He was also the drummer for Nirvana and collaborated with Cobain on many songs including Heart Shaped Box and Marigold. In addition to his frontman duties, he will occasionally step in as a drummer for Queens of the Stoneage and other bands. One of my favorite guest-drum-stints was his work on “With Teeth” for Nine Inch Nails. C’mon you have Trent Reznor and Dave Grohl on the same album! Epic. Okay I will halt my fangirl admiration and get to the good stuff. Below you shall find a list of the best known Grohl. Please Enjoy!